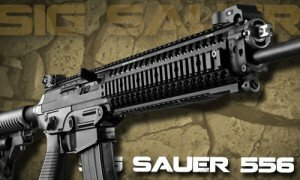 SIG Sauer is one of the world’s leading manufacturers of handguns and rifles. It all started in 1853, when three individuals named Friedrich Peyer im Hof, Heinrich Moser, and Conrad Neher, established a small wagon-making company in Switzerland. The story of SIG Sauer history and development, is a classic tale of success through hard work and persistence. The SIG saga fully demonstrates just how far great minds can go, when they are working together towards a common goal. These three Swiss gentlemen originally built what they thought would be a wagon factory, in the city of Rhine Falls, Switzerland. They went on to produce wagons and railway cars, and had no way of knowing that their company would eventually become one of the world’s largest and most respected manufacturer of small arms. After seven years of making wagons and railway cars, the three founders took up an invitation made by the Swiss Federal Ministry of Defense. The Swiss authorities were looking for a new kind of musket, in order to replace their service weapons, and the wagon company was up for the challenge. This is very reminiscent of the ascent of other popular and game-changing firearms, such as the AR-15 (M16, for your military folk), or the AK-47. The Swiss wagon company won the bid, with its innovative Prelaz-Burnand rifle design blowing out the competition. After winning that challenge, the Swiss Army ordered 30,000 units of the rifle, and the wagon company changed its name to Schweizerische Industrie-Gesellschaft (Swiss Industrial Company), or SIG. In the time between the mid-1800’s and the 20th century, SIG produced a number of firearms for the Swiss military, its law enforcement offices, and its general population. In the 1970’s, The Swiss government decreed that local gun manufacturers had to partner with a foreign company, if they are to continue manufacturing weapons in Switzerland. SIG opted to partner up with Sauer & Sohn, a German firearms manufacturer, which was founded in 1751. This company was producing handguns and rifles, and it was already known for its quality hunting rifles, shotguns, and handguns. The partnership with SIG only improved Sauer & Sohn’s reputation, and the partnership between these brilliant designers and engineers continues to produce amazing firearms to this day. Like I said, it is the story of great minds. The SIG small arms division was growing rapidly, and in the 1980’s the company turned its attention to the United States, as it saw the proverbial land of opportunity as a way to increase its share of the global market, and as a chance to supply Americans with high-quality firearms. SIG Sauer was on a mission. In 1985, SIGARMS, Inc. – the company’s U.S. branch – was established in Virginia. The American subsidiary imported handguns from Europe, and went on to produce several models of its own, such as the P225 9mm, the P226, and P228. In the year 1990, the company’s headquarters moved to New Hampshire, and there began the production of the P229, chambered in .40 S&W. In the 80’s and 90’s, the company made serious advancements in the field of firearm manufacturing. It spearheaded state-of-the-art technologies and designs. It was, and continues to be, a leader and trend-setter, rather than a mere follower of mainstream gun-making. Today, the company’s headquarters are still located in New Hampshire. In 2007, the U.S. branch changed its name from SIGARMS to SIG Sauer, and business is still booming for this arms manufacturer. Their guns are known for their accuracy and dependability, all over the world. Currently, SIG Sauer have about 900 employees. 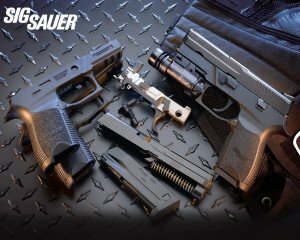 Together with Sauer & Sohn of Germany, and Swiss Arms AG (SIG Sauer’s parent company) of Switzerland, SIG Sauer makes up one of the largest firearm manufacturing companies working today. This global network of branches, consisting of companies in the U.S., Switzerland, and Germany, allows SIG Sauer to respond quickly to commercial supply and demand, to fluctuating gun laws (whether local or international), and to the fast-paced advances occurring in technology, gunsmithing, military doctrine, and law enforcement regulations. Apart from manufacturing and marketing firearms, SIG also founded the SIGARMS Academy (later renamed the SIG Sauer Academy), located in New Hampshire. Established in the late 1980’s, this training facility began as an idea thrown around by SIG execs and Federal officials from various government agencies in the U.S. The Academy was meant to facilitate the shift from revolvers to semi-automatic weapons, which was an ongoing process occurring in all U.S. agencies. The Academy was doing great things, and following its success with government agencies, there was a growing demand for the Academy to open up its gates to the civilian population. These days, the Academy not only trains troops, agents, and officers, but also offers civilian training for private citizens, as well as various organizations and businesses, which are not affiliated with the Armed Forces. This Academy has it all – a pro shop, a 360 degree range, a 1000 yard range, a maritime training area, and a tactical training area. The Academy offers two different types of training, based on the audience: Armed Professional, and Responsible Citizen. These training methods vary in a lot of ways, and they underscore the vast differences which exist between these populations. While it is an armed professional’s job to initiate contact in order to contain and manage an armed confrontation, a private citizen has no such obligation. SIG knows exactly who its audience is, and the Academy delivers the appropriate training accordingly. This was a very smart move, since it allowed SIG to reach a higher percent of the population. You don’t have to be the owner of any SIG products to take advantage of their unique training facilities. Whatever you shoot, SIG’s professional and dedicated team will have you shooting better, faster, and with greater confidence. Now, let’s go a little more in depth, and check out some of SIG’s various products. The company produces a wide (and I mean W-I-D-E) range of firearms and firearm accessories. These include pistols, rifles, air guns, telescopic sights (tactical and hunting), battle sights, red dot sights, reflex sights, mounts, rangefinders, spotting scopes, binoculars, silencers, knives, clothing, and many other kinds of accessories (right down to a SIG bar stool, no less!). 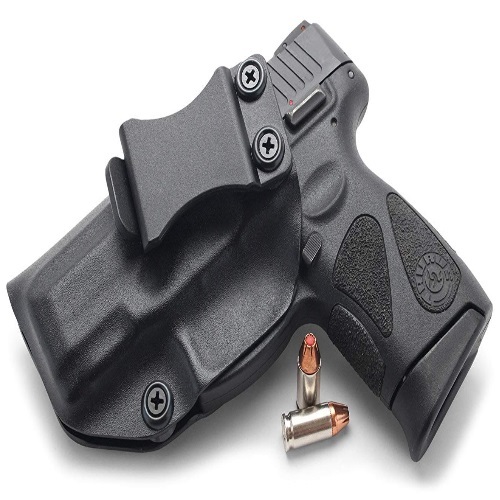 P226 – designed for the U.S. Army, and carried by U.S. Navy SEALs, Texas Rangers, and other military professionals. P229 – carried by Department of Homeland Security Office of Immigration and Customs (ICE), U.S. Coast Guard, and other federal agencies. P224 – a subcompact version of the P229, carried by federal law enforcement agents. SIG716 – a beauty, chambered in .308 (7.62X51). The bigger caliber allows you to hit targets which are further away. Ideal for big game hunters. Comes in several models. SIGMCX – “short, light, and silenced”, is what SIG claims on its website. With an ambidextrous selector, magazine release, and charging handle, this rifle is a true feat of engineering. NOTE: SIG also has a unique line of state-compliant weapons, for use in areas such as New York, New Jersey, California, Massachusetts, and other locations where state-specific laws and regulations are enforced. Make sure you comply with your local laws, and that you stay within the limits of your constitutional right to bear arms. SIGMPX ASP – a CO2 model of SIG’s MPX short barreled rifle. It is engineered in the same fashion as the original, and – like its combat counterpart – it delivers accuracy, dependability, and a high-quality performance. 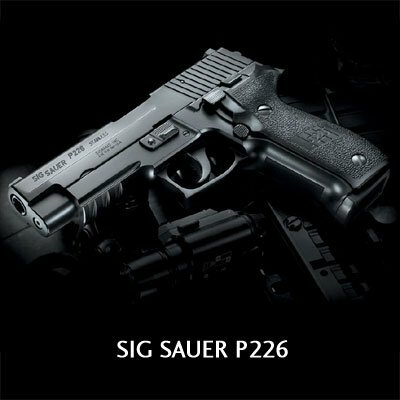 SIG P226 ASP – this is the air gun “twin” of the P226, a gun which is used by special police and military forces, around the world. Allows the shooter to train harder and better. Chambered in .177. WHISKEY5 Hunting Riflescope – rugged, crisp, clear, and accurate, this scope comes in several models, all equipped with variable powers of magnification. These scopes range from 1-5×20 magnification, to 5-25×52 magnification. The differences are vast, so make sure to choose wisely. It all comes down to your target, and your personal preferences. TANGO6 Tactical Riflescope – whether you are going on a mission or a camping trip, a 3-gun competition or just a day at the long-range shooting grounds – this scope is the one for you. Available in 4 different models, from 1-6×24 magnification to 5-30×56 magnification. BRAVO3 – designed for AR and modular sniper rifle (MSR) platforms, this sight is a fixed 3×30 magnifying optic. Incorporated into this scope is a motion-activated illuminator, which turns itself on when movement is detected. 8 daytime settings, 2 night vision settings. BRAVO4 – a fixed 4×30 scope, the BRAVO4 is a prism-powered sight which provides the shooter with a 10-degree field of view, which is significantly larger than the standard 7-degree one. Longer eye relief, fast focusing diopter, and resistant lens-coating make this scope one which is really out of sight. 20 daytime settings, and 2 night vision settings. ROMEO4 – meant for close encounters, such as close-quarter battle (CQB) or short-range game hunting, this 2 minute of angle (MOA) dot sight will enable any shooter to acquire the target quickly and easily. It is robust and very durable, built to tackle any and all kinds of lighting, weather, and surfaces. Unlimited eye relief, 8 daytime settings, 2 night vision settings. 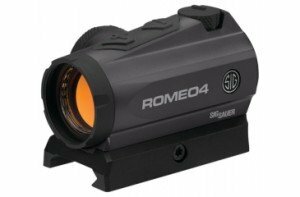 ROMEO5 – according to SIG, this sight is “as tough as it is micro”. These guys aren’t kidding about that. It incorporates motion-activated illumination, and helps to save battery power and extend the life of your sight. Unlimited eye relief, 2 MOA red dot, 8 daytime settings, 2 night vision settings. ROMEO1 – the ROMEO1 reflex sight comes in several models, each with a different rail interface. All of them feature a 3 MOA dot, 30mm clear aperture, 5 daytime settings, 2 night vision settings, and unlimited eye relief. Designed for the modern semi-auto pistol. ROMEO3 – a 1×25 open reflex sight, which is designed for MSR rifles, shotguns, carbines, submachine guns, and full-sized handguns. It features SIG’s motion-activated illuminator technology, a 3 MOA dot, unlimited eye relief, 9 daytime settings, and 2 night vision settings. XRAY3 – this category currently features only one product, the XRAY3. It comes in 4 different models, with varying notches and color configurations. With durable steel housing, and a tritium illuminator, this gunsight is one which works in day or night conditions. Ideal for every day carry (EDC), duty, or competitions. ALPHA – SIG has two kinds of mounts: tactical and hunting. Both are made of aircraft grade 6061-T6 aluminum, and feature that unique look which is reminiscent of SIG’s electro-optics. The ALPHA rings and risers are tough, and are meant to compliment the scope exactly. ALPHA products are coated to prevent oxidation and to resist oils, cleaning solutions, and long-term exposure to the outdoors and weather. KILO2000 – this 7×25 laser rangefinder has amazing distance capabilities and a 4x scan rate speed. This truly is a revolutionary piece of equipment, and it is the brain child of SIG’s gifted team of engineers. With the KILO2000, you can either point and shoot, or – as SIG recommends – use the high-rate scan mode, which will provide you with the best data, in real time. OSCAR3 – this scope comes in 2 models: the mini 10-20×30, and the micro 6-12×25. Both of them fit in the palm of your hand, for quick target acquisition. With some game, you need to judge the position before you can judge the distance and range. OSCAR5 – this thing is a beast. SIG’s premium spotting scope, with a 65mm objective lens, and 14-45x magnification capabilities. The unique optical design of the lenses make sure that the light is properly dispersed and transmitted, providing you – the viewer – with an image of the highest quality, brightness, contrast, and resolution. SIG’s ZULU binoculars series comes in many different models, with varying degrees of size, magnification, resolution, brightness, and clarity. With prices ranging from about $200 (ZULU3 models) to nearly $1000 (ZULU9 models), there is something for everyone in this category. A good pair of binoculars is essential for any mission, and with SIG’s optics, you know you are getting the best. SIG offers 2 pistol silencers and 9 rifle silencers, as well as the revolutionary SRD22, meant for use with pistols or rifles chambered in .22LR. SIG’s line of silencers are quieter, more durable, and easier to use than ever before. With a variety of calibers and high-grade materials to choose from, SIG’s silencing products are all top shelf, and they deliver a big punch in a subtle way. The company also offers a few muzzle attachments, which aim to stabilize after-shots, and reduce muzzle flash during operation. SIG is more than a firearm – it’s a way of life. In the clothing department, SIG Sauer offers T-shirts, hats, sweatshirts, jackets, hoodies, and other apparel. SIG also has holsters, magazines, knives, pouches, slings, pistol cases, range bags, tactical handheld lights and lasers, and weapons replacement parts. This Swiss/German/American dream team also offers its customers goodies like a SIG iPhone case, cocktail shaker, coffee mug, beer stein, shot glasses, water bottle, car decals, stickers, patches, keychains, posters, gun mats, and much more. Guaranteed to help you get your SIG swag on! As you can see, SIG Sauer has a very long list of firearms. Because it is interested in the utmost satisfaction of its customers, it has established a custom shop, which offers SIG owners the chance to spruce up their firearm, and get it up to peak condition, through their excellent customer service. And, speaking of excellent customer service, SIG is proud to offer its customers a limited lifetime warranty on firearms. SIG’s firearms will be free of defects in material, workmanship, and mechanical function. 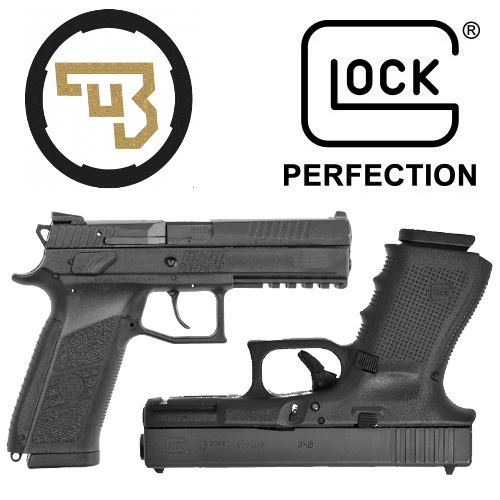 This warranty is guaranteed for the lifetime of the original purchaser of the firearm. SIG’s optics carry an Infinite Guarantee, which is an unlimited lifetime warranty. It is fully transferable, requires no warranty card or receipt, and is given at no charge. The electronic components of SIG’s optics are guaranteed for 5 years. This limited warranty covers any defects in materials and workmanship in the electronic and Tritium components of SIG’s illuminated riflescopes/sights, flashlights, lasers, binoculars, spotting scopes, and rangefinders. SIG realizes that in the world of firearms, too, there are amateurs and professionals. Precisely for those unique shooters – who rightly consider themselves to be part of an elite, and who demand nothing but the very best from themselves and their weapons – SIG has taken two of its most popular firearms, and given them a serious overhaul. So far, SIG’s Legion model series includes the P226 and P229 pistols, with others in line to join them. The engineers at SIG Sauer worked tirelessly, in order to provide the professional shooter with enhancements and features which better suit the professional’s style. 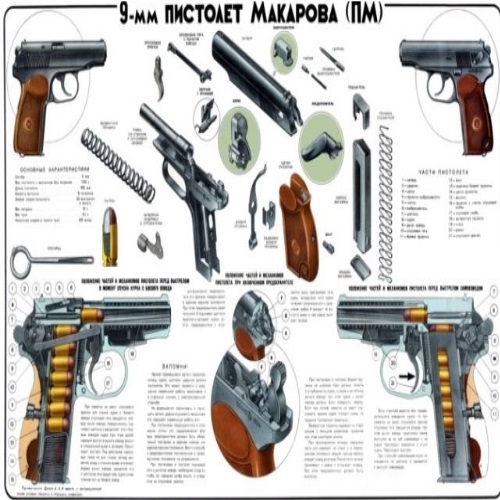 These features include, but are not limited to: reduced and contoured beavertail, enhanced action, low profile slide catch and de-cocking levers, solid steel guide rod, reach-adjustable trigger, custom and checkered grips, and a high contrast XRAY sight. The Legion series enhancement does not only include firearms, but it is also the door to exclusive opportunities and gear from SIG. According to the company, the future will bring with it an array of firearms, accessories, and one hell of a shooting experience that is unlike any other. SIG Sauer is committed to excellence. It has a proud tradition of nothing less than brilliance. SIG has been bringing it with force, ever since the mid 1800’s. I wasn’t around back then, but I’ll bet that even when those Swiss gentlemen were busy making railway cars and wagons, their products must have been the finest in all of Switzerland. The SIG story is one of humble beginnings, seized opportunities, long-term thinking, and enduring success. This company would not have made it, if it wasn’t one of the best in its field. It came through for the Swiss authorities back then, and it comes through for its numerous clients and customers now. Civilians, law enforcement officers, government agents, military personnel – all over the world, there are people who know that SIG is synonymous with quality and ingenuity, and who trust this company’s weapons with their lives. The SIG story is one of inspiration, perspiration, and innovation. It just goes to show that when you put your mind to it, you can achieve pretty much anything.